A '14 and late '13 coil box and lid is an odd ball. A '15 is also different. Don't know for sure about the others. William, as far as I know, the 19 coilbox will have a slant top lid of three pieces. I will have the switch on the front of the box and that switch will be covered by a full steel cover. William,If you don't have one,I can probably find one for you.I think there are several in the barn. Any box from '17 to '22 (non-starter) will fit your bill, Bill - Ha-Ha - get it ? Like Jack, I have excess to my needs also. I do not have one but I will need one come spring. Let me know what you have and price. You can PM me, a picture would be great, if possible. I'll try to get a picture for you. I may not have a lid. William, that coil box you need will have the Bat - Mag switch attached and that part will cost you a lot more than the coil box will cost, if you find a good one. The proper key cost will also surprise you. That was a good plan to start looking now. 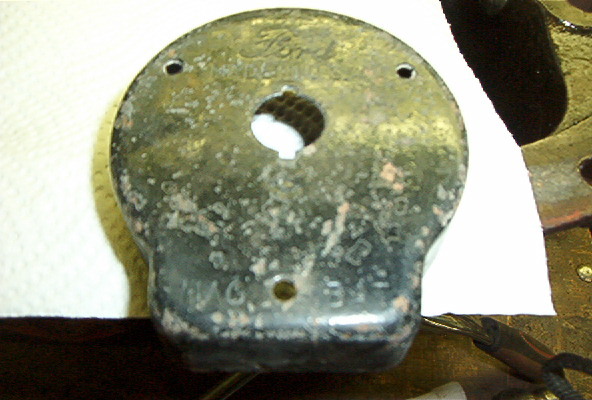 By '19, the box mounted switch key was the flat one. The earlier key with the round pin is by far a better key. 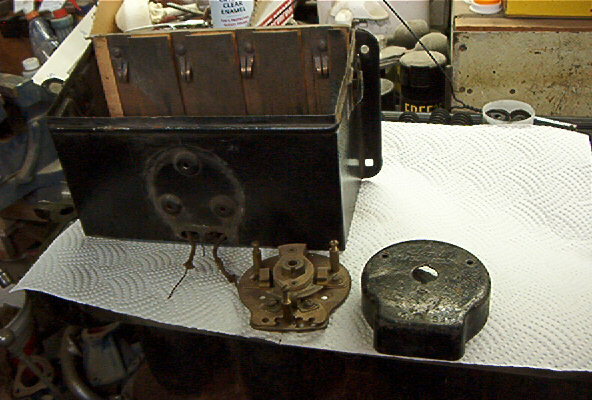 Here are two samples of the about 1917 to 1919 coil boxes. You will need to click see original ad to see all the photos. The one you need will have the brace that runs from front to back. William,Can;t seem to send pictures on email. here they are..
Uncle Jack: interesting your cover has the diamond. Not real common. Are you referencing the 'diamond' imprint just under -about 3/8"- the ignition opening? If so, I went out to the Conservatory and grabbed up 3 early ignition switches with covers and 2 of them had the 'diamond' where I described. If they're really "Not real common", I'd trade 'em for a Confederate officer's sword. Maybe I should have kept my opinion to myself! I was going by the brass plates used from late '13-'16, and the plates with the diamond on them don't seem to be as common as the ones without the diamond. Thanks Larry. George ,what happened to the one they issued you? ?